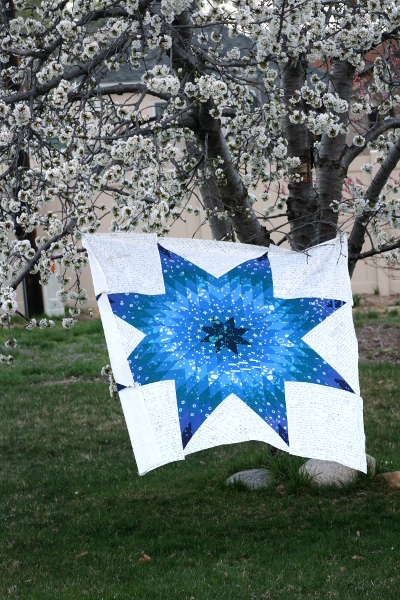 Meet my Indigo Star quilt! I completed this quilt top in the spring, just after we returned from our trip to the San Francisco Bay area. It makes me smile to see these photos of the quilt swaying in the breeze with cherry blossoms all over our tree. Inspired by the gorgeous colors and prints in the Handcrafted Indigo collection by Alison Glass, this quilt top came together even more beautifully than I pictured. 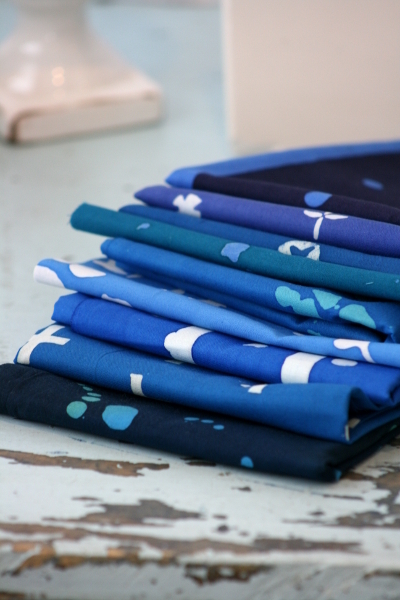 All these shades of blue together – I can’t get enough of them. Blue has been my favorite color for most of my life, and I don’t think I’ll ever get tired of it. The quilt top was pieced using the strip piecing method in my lone star tutorial, except that I added more diamonds (strips) to the star. This star measures about 62″ square. 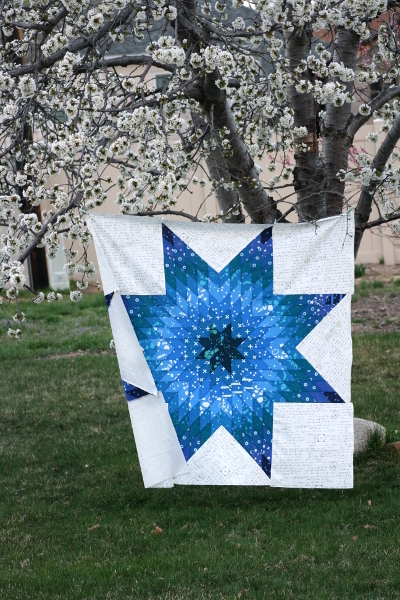 The lovely script fabric from Quilting Treasures was the perfect background for this star. I love that it gives some interest to all the negative space. I must say how beautiful these prints are. I have loved working with all of the Handcrafted collections. 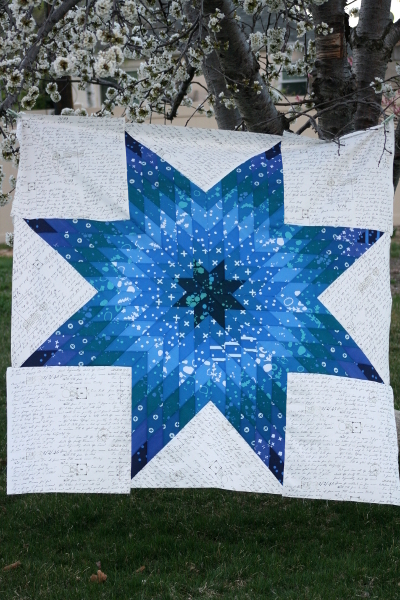 (You may remember my Modern Maples quilt made with the first two releases.) They are a beautiful interpretation of the traditional batik and have helped me stretch creatively. This quilt is also back from being quilted in a fabulous, modern style that I can’t stop staring at. I’m excited to take some photos and share more. You’re going to love it! 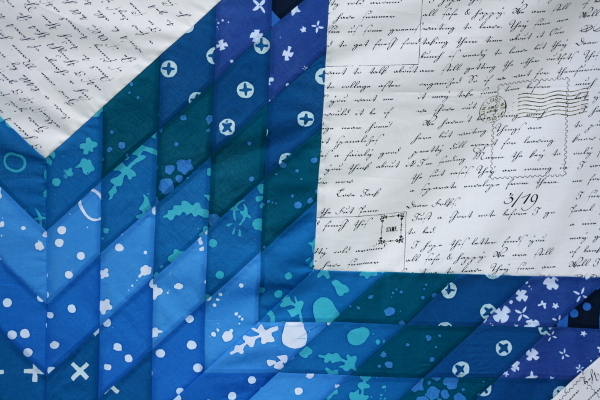 *Note: See the finished quilt here, with gorgeous quilting and pattern information. 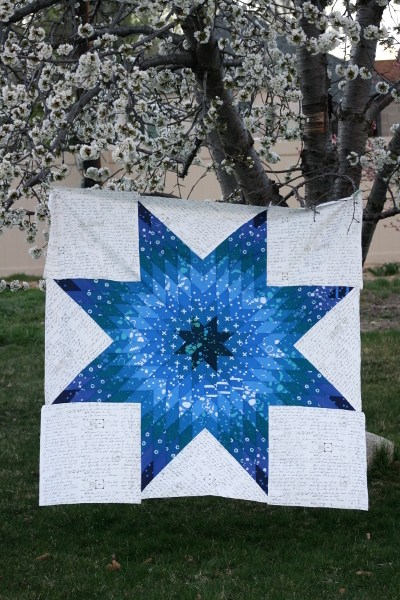 For more lone star quilts, including links to tutorials and patterns, visit my Lone Star Page. Would love to see a tutorial for this one!